Doris Baine O’Neal transitioned to her heavenly home on Tuesday, December 11, 2018. She was born on April 7, 1926, to Joseph and Ida (Carty) Baine. She was a lifelong resident of Chattanooga and was educated in the Chattanooga Public School system. After becoming one of the first African American claims adjustors at Interstate Life Insurance Company where she was employed for 35 years, she later retired from Provident Insurance Company after a total of 45 years in the industry. 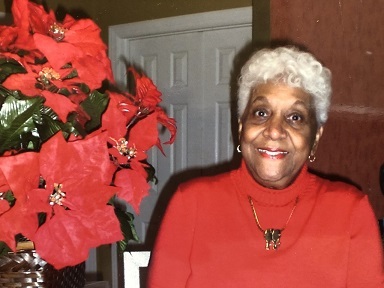 She was an active and lifelong member of Thompkin Metropolitan A.M.E. Zion Church where she served as Leader of Leaders; member of the Albert Miller Sr. Choir; the Women’s Home and Overseas Missionary Society; and various other boards and committees. She was also a member of the Church Women United Organization where she received the coveted “Valiant Woman” Award. “Mama Doris” as she was affectionately known by many, never met a stranger and she always had a positive perspective to share. She was preceded in death by her parents, Joseph and Ida Carty Baine; husband Paul L. O’Neal, infant son Bobby; sisters, Hilda Keeton, Glyndon Crump and Lucille Thompson; brothers, Ed Lee Jackson and Robert William Baine Sr.
Those left to cherish her memory are her devoted daughters and son, Patricia (Jack) Mason (Chattanooga), Janis Ann Jones (Silver Spring, Md.) and Ronald (Carol) O’Neal Sr (Chattanooga); sisters, Brittie Ervin, Mary (Raymond) Reynolds and Marjorie McBee, brother, Rheubin Baine, all of Chattanooga; six grandchildren, nine great-grandchildren and a host of other relatives and friends. Public viewing will be held on Sunday, Dec. 16, from 12-8 p.m. at John P. Franklin Funeral Home. The family will receive friends on Monday, Dec. 17, at 11 a.m. at Hawkinsville Missionary Baptist Church, with the Homegoing Service to follow at 12 p.m. Burial will be at National Cemetery. Contributions in memory of Mrs. Doris O’Neal may be made to the Chattanooga Times Neediest Cases or Thompkins Chapel AME Zion Church, 812 Palmetto Street, Chattanooga, Tn.